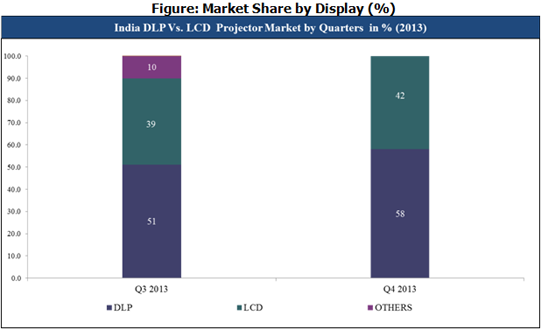 India Projector market shipments volume reached 38,006 units in CY Q4 2013, a decline of 22% over the previous quarter. BENQ emerged as the new market leader. 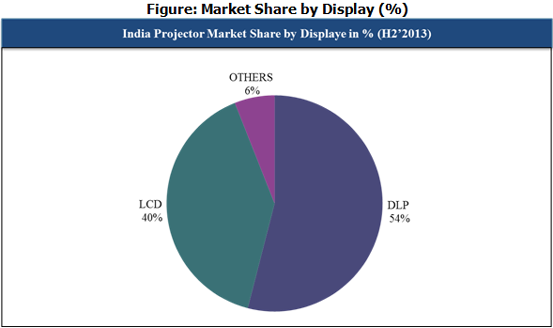 India Projector Market registered a total Shipment of 38,006 units in CY Q4 2013, representing a decline of 22% over the previous quarter. BENQ emerged as the new market leader followed by SONY and EPSON. For CY Q4 2013, more than 57% of the total shipments are based on Digital Light Processing (DLP) technology. Whereas, in Resolution, around 64% projectors are High-Definition (HD). Further 51% of the unit shipments are enabled with 3D projection. Note: Others include D-ILA and LED display projectors. Top three player’s holds 43% of the total market share. Out of the total shipment more than 43% market is captured by 1024x768 display resolution. Wi-Fi enabled projector have marginal contribution in the total market share. High-Definition (HD) are cannibalizing the Standard-Definition (SD) projectors market share. In CY Q4 2013, contrast ratio feature is lead by 3000: 1 ratio contributing 18% of the total market share followed by 4000:1 ratio in terms of unit shipments. Further, projector lamps having 5000 Hours of lamp life are demanded more by the Indian consumers registering 20% of the total market share.